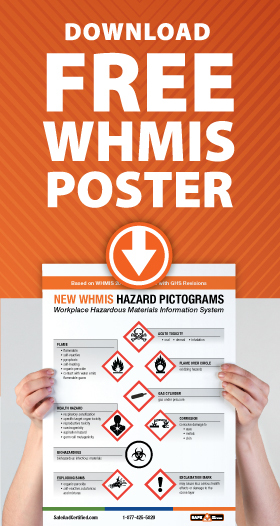 As a result of the alignment of the Workplace Hazardous Materials Information System (WHMIS), with the Globally Harmonized System of Classification and Labelling of Chemicals (GHS), the old (1988) WHMIS hazard symbols have been replaced by universally acknowledged WHMIS Pictograms. You will find pictograms (WHMIS Symbols) on Product Supplier Labels and on Safety Data Sheets (SDSs). Generally, WHMIS Symbols / Pictograms are a simplified graphic image to identify the type of hazard of various hazardous materials. Universally recognized, these standardized images are easy to understand and the hazardous nature of the product such as explosive, corrosive, flammable, etc., can be understood quickly and the correct precautions can be taken in handling the product, reducing the workers risk in interacting with the product. All WHMIS 2015 pictograms (symbols) are made of a distinctive red diamond border with the symbol representing the hazard associated with a product (such as corrosive, health hazard or fire) inside the border. Together, the border and the symbol are called a pictogram and are assigned to a specific hazard category or class. NOTE: There are some hazardous products that meet the criteria for a hazard class or category but do not require a pictogram. For complete details on these WHMIS 2015 classes visit the Government of Canada website CCOHS. The new WHMIS symbols are contained within a red diamond shaped border vs the black circle borders of the WHMIS 1988 symbols. This change is more effective in making the symbol more visible as it now stands out from the red border. There are no longer letter based symbols like the 'Exclamation T' for other Toxic effects or the letter 'R' for Dangerously Reactive. These have been replaced with symbols which are definitely an improvement since the letter based symbols were reliant on knowledge of the English language. Overall, the change to utilizing universally accepted symbols improves the entire WHMIS 2015 Symbol / Pictogram set. Skull and Crossbones Pictogram is used for hazardous products that can cause death or acute toxicity if inhaled, swallowed or through skin contact, even in small amounts. The symbol of the flame indicates a potential fire hazard and includes, flammable gases, liquids, aerosols and solids; prophoric liquids, gasses and solids; self-heating substances and mixtures; substances and mixtures that produce flammable gases in contact with water; organic peroxides; and self-reactive substances and mixtures. The flame over circle pictogram is used to indicate oxidizing. Fire and/or explosion risk in the presence of flammable or combustible materials. May enhance the combustion of other materials. The Gas Cylinder symbol indicates gasses under pressure that may explode of heated, punctured or dropped. Gasses could include dissolved gas, liquefied gas, compressed gas and refrigerated liquefied gas. The Health Hazard pictogram is used on product labels and SDSs that cause or are suspected of causing allergic reaction, respiratory sensitization, specific target organ toxicity, reproductive toxicity, carcinogenicity, aspiration hazard or germ cell mutagenicity. The Corrosion WHMIS GHS symbol is used on products that can cause severe skin burns and eye damage. It is also used for products that can are corrosive to metals. The Exploding Bomb symbol is used for products at risk of explosion due to fire, shock, friction, heat or puncture. This pictogram is placed on labels of mixtures of self-reactive substances and organic peroxides. The Exclamation Mark WHMIS 2015 symbol is used for products that may cause less serious health effects. The product may be harmful to skin, cause eye irritation, respiratory damage and/or fatal in large doses. The Biohazardous symbol is used only in Canada and was retained from WHMIS 1988. It indicates the product may have organisms or toxins that can cause disease in humans and animals. As an example, it is used on growths of organisms like salmonella or e.coli bacteria cultures.